Witchford Neighbourhood Area was designated by East Cambridgeshire District Council in August 2016. The boundary, as currently designated, follows the existing Witchford parish boundary. Witchford Parish Council is actively preparing a Neighbourhood Plan for its area. East Cambridgeshire District Council has undertaken a Community Governance Review (CGR) to make minor changes to some parish boundaries. As a result of the CGR, the boundary of Witchford parish will change slightly. New parish boundaries will come into effect in early Spring 2019. Further information on the CGR is available on the Council meeting 12 July 2018 page. 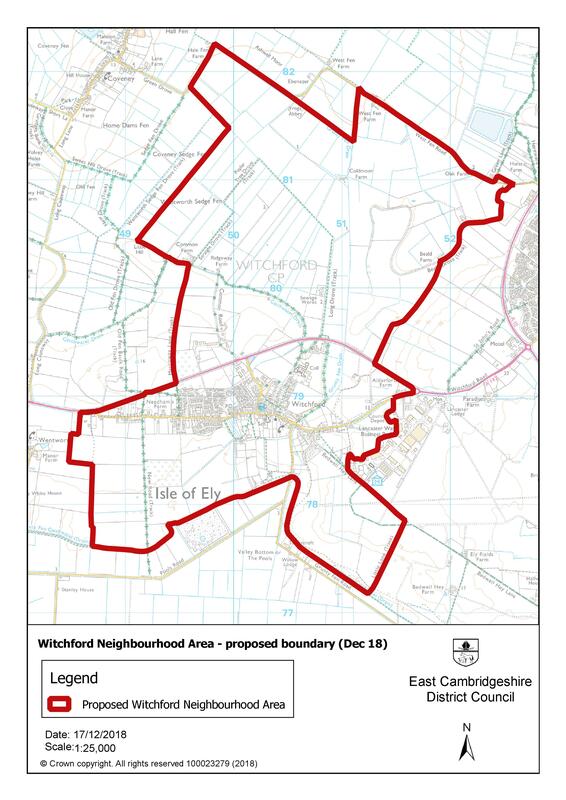 Witchford Parish Council has submitted a new Neighbourhood Area application, requesting the current Neighbourhood Area be amended to reflect the forthcoming changes to the parish boundary. The Neighbourhood Area application and a map of the proposed Neighbourhood Area is available to download below. Alternatively, a paper copy of the Neighbourhood Area application and map are available to view at East Cambridgeshire District Council's office. All comments must be received on or before 04 February 2019. Please note, all personal information you provide will be held solely for the purpose of determining the Neighbourhood Area application.